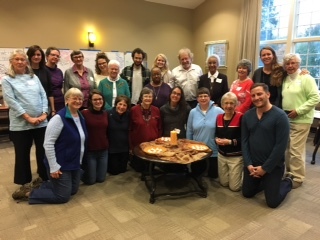 Nuns and Nones (religiously unaffiliated young adults) met for two days at Cranaleith Spiritual Center, sharing conversation, contemplation, reflection and nourishment. Sr. Mary Elizabeth Looby, GNSH, was one of the 14 religious women who met with these 9 young adults who were performance artists, interfaith folks, social justice advocates, workers with sanctuary movements, communications and ecologically concerned persons and doctoral students. Some had never met a sister before; some were formerly Catholic or from other faith traditions. department—a grassroots action network inciting creativity and social imagination to shape a culture of empathy, equity, and belonging. ) and Wayne Muller, a United Church of Christ pastor. * are seeking community that is open to questions and the continuous search for meaning. The Nones spoke about their desire for community, inclusion and justice. The sisters were impressed with the work that these folks were into and heard their desire to be included and part of a larger fabric of life. They need to be supported and encouraged and often feel alone. What people saw coming out of this meeting was connection, support, networking, community building, reciprocal and intentional sharing of resources, bibliography. Thank you so much for this article, for your great work, and for the very helpful web links included. You are definitely on the right track with this work! We are interested as well and will be getting up to speed on Nuns and Dones. Wonderful article and what a way to open a door to communication. I hope it continues. Too many are unaware of the good works of the Sisters.